It was back in 1905 that the Kutztown Fair Association was created and the fairgrounds were moved to the current site. For 34 years prior to that there were annual fairs held on grounds located on the south side of Kutztown in an area bounded by Whiteoak Street and Baldy Street. Those fairs were organized and conducted by the Keystone Agricultural and Horticultural Society. Even prior to the existence of the Society the residents of Kutztown and surrounding areas could attend "fair like" events but records show that they were a bit disorganized and at times on the brawny side. Some of the very early events were called Battalion Days and were attended by members of militia and ruffians. With the new fairgrounds opening in 1905, Kutztown quickly became well known for its superior racetrack. Horsemen from all over the country claimed that Kutztown's ½ mile track was second to none. Over the years several records were broken on this track. In 1942 the grandstand burned down and auto racing took the place of horseracing. Auto racing continued until a fatal racing accident in 1947 ended racing for several decades. During the 1990's auto racing resumed with smaller cars on a smaller racetrack. So once again you can enjoy racing at Kutztown. By 1915 the Kutztown Fair was considered one of the major events of Berks County and people came from far and wide by railroad, trolley, and horse. Admission was $.25 per carriage plus $.25 per rider. In addition to agricultural displays, schools and children were encouraged to enter educational exhibits. Premiums often were items such as an alarm clock, ½ ton of coal, horse shod free, or a pair of trousers. Today, the Kutztown Fairgrounds has become home to the Pennsylvania German Festival, which is held in late June and early July. This well-known festival is a cooperative venture between the Kutztown Fair Association and Kutztown University. 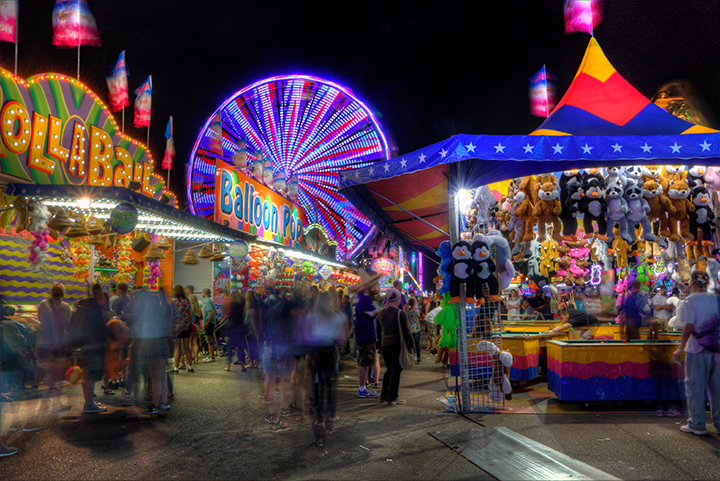 The Fairgrounds also hosts many other events throughout the year, including dog shows, public sales, car shows and other social events. Over the last 100 years the Kutztown Fair has changed with the times and grown considerably. Each year the Kutztown Fair Association looks to improve our fine little fair. The next 100 years promises to be even better than the last 100. We ask that you remember all the businesses, groups, and individuals who volunteer their resources to help make the fair a success. We respectfully thank them and, at the same time, encourage you to take notice of their efforts and patronize them.